We’d love your help. Let us know what’s wrong with this preview of Campbell's Kingdom by Hammond Innes. At 36, Bruce Wetheral, a London insurance clerk, finds he hasn't much time to live. A few hours later he also learns that he has become sole heir to his grandfather's failing Canadian enterprise. Campbell's land--perched at 7000 feet in the Canadian Rockies--may contain vast resources of oil. The old man's partners offer him a moderate sum for control. He declines the offer and launches his own search for Rocky Mountain "Black Gold." To ask other readers questions about Campbell's Kingdom, please sign up. The only way I can describe the experience of reading any Hammond Innes book is to say it feels like I'm reading a 1950's black & white movie. A very good black & white movie. How would you spend the last few months of your life? Bruce Weatheral faces the dilemma when he’s diagnosed with untreatable stomach cancer. It’s hard to know which is worse: the prospect of death within weeks, or the idea that he will spend them living in his dingy rented room in London and commuting to his uninspiring City job in insurance. But the same day he receives his death sentence, he also learns of an actual death: his grandfather, Stuart Campbell, died the previous autumn, in his lonely How would you spend the last few months of your life? But the same day he receives his death sentence, he also learns of an actual death: his grandfather, Stuart Campbell, died the previous autumn, in his lonely log cabin in the plot of land, high in the Canadian Rockies, that had come to be known as “Campbell’s Kingdom.” That land is now Bruce’s. The news is less of a blow than a surprise. The only time Bruce had met his grandfather, it was as the latter was being released from gaol, after serving a sentence for fraud. He had raised money to prospect for oil in the Kingdom, and then every penny had gone missing (with his partner, as it happened, but Stuart faced the music alone). The poverty-stricken grandson had had his childhood made miserable by his grandfather’s disgrace, and had done little with his life since then, except for his war service, which had been distinguished. Now he has to come to terms with the knowledge that far from disappearing to live off the gains of fraud, Stuart Campbell had gone back to the place he had hoped to find oil. He had lived not far from (though not amongst – they would not have tolerated that) the very people who felt he had stolen the money they’d invested in his dreams. He had lived way up there and devoted his remaining years to vindicating himself and proving his refrain, “there’s oil in the Rocky Mountains” – an expression that had slid into oilmen’s vocabulary to mean a hopeless dream. Bruce’s legacy isn’t just the land, it’s also a plea made to him by a letter from his grandfather, to take up the cause where he had had to lay it down, to prove him right, and to bring in an oil well at the Kingdom. That’s an apparently hopeless task in itself – all the indications, including a recently completed survey, suggest there’s no oil there. It’s made all but impossible by a company that is anxious to buy the land from Weatheral, in order to flood it, by building a dam for electric power that will bring back work to the miserable town of Come Lucky below the Kingdom. But what better way for a dying man to spend his remaining days but rise to the challenge of the impossible? So that’s how Bruce decides to answer the question I asked at the beginning. He'll spend his remaining time taking on the daunting world of the high Rockies, the hostility of the few remaining inhabitants of a ghost town, and a powerful corporation trying to thwart him. All with no funds to speak of at his disposal. Will he be able to drill for a well at all? If he does, will it strike oil? And will he be able to do it before the dam is finished and the land flooded? Hammond Innes may not be the greatest of writers, but along with Nevil Shute or John Grisham, he can tell a gripping story. This one doesn’t fail. And it doesn’t cheat. There’s a double peril, one disaster following another, but Innes lets us know, if we read carefully, about them both early on. So while the ending is dramatic, it isn’t plucked out of nowhere. Which to me is what you have the right to expect from a punchy, exciting novel of the wilderness. 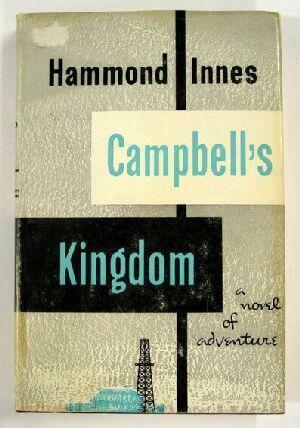 Campbell’s Kingdom by Hammond Innes, published by Collins in 1952, is one of my favourite stories, and one I am happy to read at regular intervals when there is nothing else on the skyline. In essence, after gaining three months first hand background experience of drilling in the Canadian Rockies, Hammond Innes got down to writing a gripping adventure story. Given only two months to live, 36-year-old Bruce Wetheral returns to his lodgings one day in a dream, feeling that he has wasted his life as an insurance clerk, only to be told by a solicitor that he is the owner of a small valley in the Canadian Rocky Mountains as a result of a bequest by his grandfather. After reading his grandfather’s letter expressing his strongly held hopes and beliefs, he decides to chuck his job and emigrate to Canada, and dedicate what is left of his life to proving his grandfather’s lifelong conviction that ‘There’s oil in the Rocky Mountains’. When he arrives, he finds his plans are threatened by the construction of a new hydroelectricity dam. The race is on prove his grandfather is right, amid a blossoming friendship with his friend, Jean Lucas, before the crooked construction manager in charge of building the dam can flood the valley. The film of the story produced in 1957 did the story full justice, starring Dirk Bogarde as Bruce Wetheral, helped by Michael Craig as the geologist, Boy Bladen; and James Robertson Justice as the drilling contractor, James MacDonald; and Barbara Murray playing Jean Lucas, as the love interest. I am still trying to get a DVD of the film – let me know, if anyone hears of one. This was the first book in English I read in 1961. I had FL. 2.50 pocket money a week at the time. Books like Innes wrote were about Fl. 2 each. I bought all of his novels available in those days and learned to improve my English considerably that way. I still have all those books. Fond memories. This was much like a Desmond Bagley book, with the same sort of central character; tough, resourceful, ex army, motivator, with high moral standards. The writing was pretty good, and whilst not fast paced it kept my interest, slowly building to the climatic end. You can tell this was written in '52, but that contributed positively to the feel of the book and the raw, rugged, red neck characters. Glad I picked this up at a second hand book fair. I again love this type of adventure story, that good it was made into a film. Hubby is an Innes fan and has almost read his whole catalogue. He thoroughly enjoyed this book and it only took him two days to get through. Comes highly recommended. This book was much better than I expected! When I first got this book I had no urge to read it, I only picked it up because it was cheap and the edition matched my other classics, and I didn’t even read the blurb on the back so it was definitely an impulse buy! Basically, this book follows the character of Bruce Wetheral, an English man, who finds out his Grandfather has died and left him some land called Campbell’s Kingdom. This land was in the Rocky Mountains and Bruce’s Grandfather was convi This book was much better than I expected! When I first got this book I had no urge to read it, I only picked it up because it was cheap and the edition matched my other classics, and I didn’t even read the blurb on the back so it was definitely an impulse buy! Basically, this book follows the character of Bruce Wetheral, an English man, who finds out his Grandfather has died and left him some land called Campbell’s Kingdom. This land was in the Rocky Mountains and Bruce’s Grandfather was convinced that the land had oil, but because of financial difficulties, he had been unable to find out. So Bruce goes to the town, to discover more about his grandfather and the potential oil in Campbell’s kingdom. The book is split into three parts and all of them are beautifully written; there is no denying that Innes is a good writer. The first part was very interesting, we get to know the characters who were all unique and very relatable. I was worried I would get confused, as there are a number of characters, but I ended up finding them quite easy to distinguish. The scene was also beautifully set by Innes, I had a real picture of the Campbell’s Kingdom and Come Lucky in my mind, I had never read a book set in this area before and it was interesting to read. However, for me, the second part dragged a lot. This book is very slow going, I did like the plot and the suspense of whether oil would be found or not, but Innes is very descriptive and there would often be one or two pages of description of the Rocky Mountains, which I personally felt was too much. I sometimes felt myself losing concentration and having to have a break from this book to regain concentration. Also, this part of the book is around 150 pages and there is only two chapters with one chapter being 100 pages long. This didn’t deter from the book, but if you are finicky like me and prefer to finish at the end of a chapter, that is one very long sitting. The third and final part of the book was short, but quite a bit happened and there was a lot of action compared to the rest of the book. I won’t go into a lot of detail because I don’t want to spoil but this for me was the best part of the book. I did like the ending, however there were some details which I felt maybe weren’t as plausible as the rest of the book and it did slightly annoy me, however overall it was a good book. I am going to give this book three stars. I liked it but I didn’t love it. I am very character driven reader and I loved all the characters and how the book was set out, but it was hard going sometimes to read and I sometimes felt like the plot wasn’t moving forward. I would read more Innes and I recommend this book to people who do enjoy classics and their sometimes slow-moving plots. However if you like a lot of action, I do believe you may have some difficulty with this book. About the oil fields in Canada with background of all the intricate details. His grandfather had formed a company in Canada and he's now the holder of all of the company as his grandfather has died. Lots of mysteries await him as he starts to solve what is going on..the survey reports were false and he has the real ones...could it be there is oil under the land? Building of the dam and the sale of the land is a plan that is up for controversy. Loved hearing of the land and the pure nature still there as the men climb up to the land. When he first arrived in Canada he knew he only had a few short months of his life left but something happens to complicate it all. In his era Hammond Innes was one of the UK's best thriller writers and I love all his work. This is one of the best known and a fine example of his talent. How refreshing to start at the beginning and read through to the end in a single thread. It may be a bit dated but it was written and set over 60 years ago. One of my favourite writers, I'm never disappointed. He always write a gripping good story, and the reader is never disappointed. Superb book, great story and hard to put down. The imagery of the Rockies is really strong. This is one of Hammond Innes best! This is not one of Hammond Innes' best books (in my opinion). It involves oil-prospecting in the Canadian Rockies. Ralph Hammond Innes was an English novelist who wrote over 30 novels, as well as children's and travel books.He was awarded a C.B.E. (Commander, Order of the British Empire) in 1978. The World Mystery Convention honoured Innes with a Lifetime Achievement Award at the Bouchercon XXIV awards in Omaha, Nebraska, Oct, 1993. Innes was born in Horsham, Sussex, and educated at the Cranbrook School in Kent Ralph Hammond Innes was an English novelist who wrote over 30 novels, as well as children's and travel books.He was awarded a C.B.E. (Commander, Order of the British Empire) in 1978. The World Mystery Convention honoured Innes with a Lifetime Achievement Award at the Bouchercon XXIV awards in Omaha, Nebraska, Oct, 1993. Innes was born in Horsham, Sussex, and educated at the Cranbrook School in Kent. He left in 1931 to work as a journalist, initially with the Financial Times (at the time called the Financial News). The Doppelganger, his first novel, was published in 1937. In WWII he served in the Royal Artillery, eventually rising to the rank of Major. During the war, a number of his books were published, including Wreckers Must Breathe (1940), The Trojan Horse (1941) and Attack Alarm (1941); the last of which was based on his experiences as an anti-aircraft gunner during the Battle of Britain at RAF Kenley. After being discharged in 1946, he worked full-time as a writer, achieving a number of early successes. His novels are notable for a fine attention to accurate detail in descriptions of places, such as in Air Bridge (1951), set partially at RAF Gatow, RAF Membury after its closure and RAF Wunstorf during the Berlin Airlift. Innes went on to produce books in a regular sequence, with six months of travel and research followed by six months of writing. Many of his works featured events at sea. His output decreased in the 1960s, but was still substantial. He became interested in ecological themes. He continued writing until just before his death. His last novel was Delta Connection (1996). Unusually for the thriller genre, Innes' protagonists were often not "heroes" in the typical sense, but ordinary men suddenly thrust into extreme situations by circumstance. Often, this involved being placed in a hostile environment (the Arctic, the open sea, deserts), or unwittingly becoming involved in a larger conflict or conspiracy. The protagonist generally is forced to rely on his own wits and making best use of limited resources, rather than the weapons and gadgetry commonly used by thriller writers. Four of his early novels were made into films: Snowbound (1948)from The Lonely Skier (1947), Hell Below Zero (1954) from The White South (1949), Campbell's Kingdom (1957), and The Wreck of the Mary Deare (1959). His 1973 novel Golden Soak was adapted into a six-part television series in 1979.